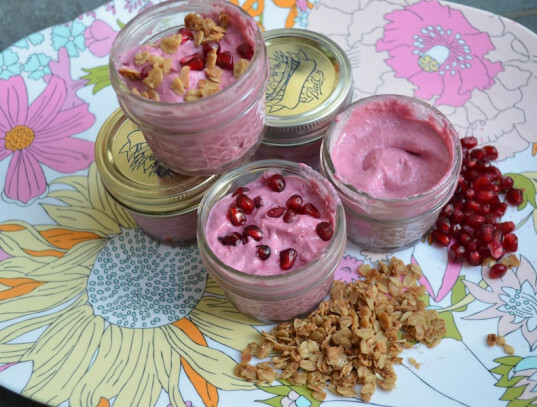 The Valentine's Day challenge: making a healthy, portable, pinkalicious treat that can be enjoyed pretty much any time of the day. This vegan, no-cook berry pudding is absolutely delicious, and so easy you won't even believe it. Aside from soaking the cashew nuts, the whole treat takes about a minute to throw together yet will stay (without toppings) in your refrigerator for several days. Organic frozen fruit gives the pudding a festive color, maple syrup adds a bit of natural sweetness, and cashews make a creamy base that provides a hefty dose of heart-healthy fats and copper as well as magnesium for strong bones. 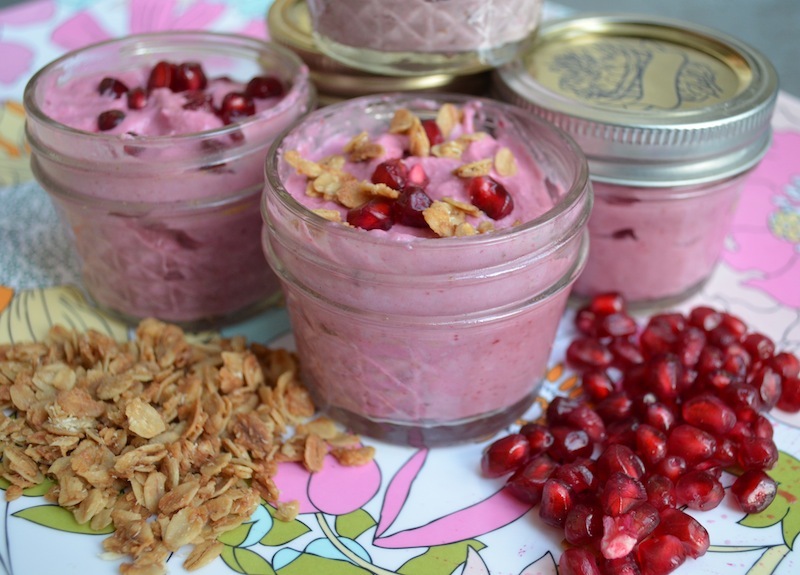 It's a pudding that is undeniably a wonderful dessert, but can easily (and without guilt) be served for breakfast or an afternoon snack with granola and pomegranate seeds or cranberries. Portion the pudding into Mason jars, and you've got a portable treat for all your adventures. Read on for a healthy and delicious Valentine's Day indulgence! As always, we recommend buying organic ingredients whenever possible. Put the nuts in a bowl and cover with water (preferably filtered). Let soak for 2-3 hours to soften the cashews and make them easier for blending. 3. 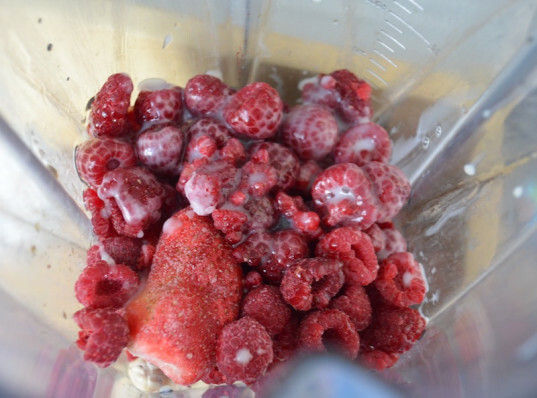 Blend the ingredients in a high-speed blender. Drain the cashews. Place all the ingredients in a blender. I recommend putting the maple syrup and non-dairy milk in before the cashews or strawberries and/or raspberries to make blending easier. For both the milk and maple syrup, start with 4 Tbsp and add another only if needed. Blend until smooth, pausing to scrape down the sides of the blender as necessary. 4. Spoon out, add on any toppings, and serve. Using a spatula, spoon the pudding out of the blender and into the Mason jars. If serving immediately, add desired toppings. Or cover the puddings with a lid and refrigerate until ready to serve. This recipe makes about enough to fill four 1/2 pint Mason jars. Gather the ingredients. Put the nuts in a bowl and cover with water (preferably filtered). Let soak for 2-3 hours to soften the cashews and make them easier for blending.Drain the cashews. Place all the ingredients in a blender. I recommend putting the maple syrup and non-dairy milk in before the cashews or strawberries and/or raspberries to make blending easier. For both the milk and maple syrup, start with 4 Tbsp and add another only if needed. Blend until smooth, pausing to scrape down the sides of the blender as necessary.Using a spatula, spoon the pudding out of the blender and into the Mason jars. If serving immediately, add desired toppings. Or cover the puddings with a lid and refrigerate until ready to serve. This recipe makes about enough to fill four 1/2 pint Mason jars. I love this recipe! but, our school is completely nut free (as are many schools). 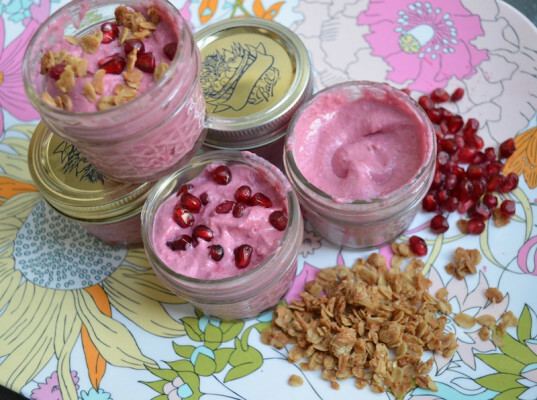 Any recipes for yummy pink treats that are nut free? 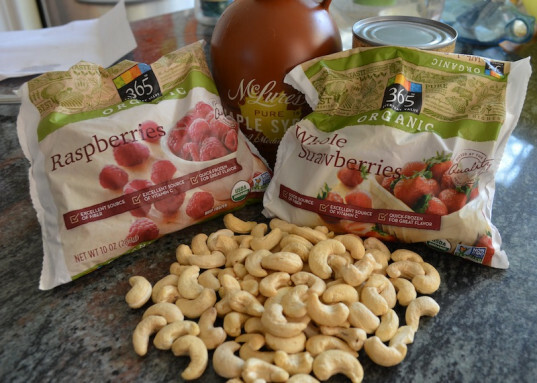 1 cup cashews 1 1/2 cups frozen organic raspberries or strawberries (or a combo of both) 4-5 Tbsp maple syrup 4-5 Tbsp non-dairy milk such as coconut, almond, or soy Toppings such as berries, granola, even chocolate shavings Gather the ingredients. Put the nuts in a bowl and cover with water (preferably filtered). 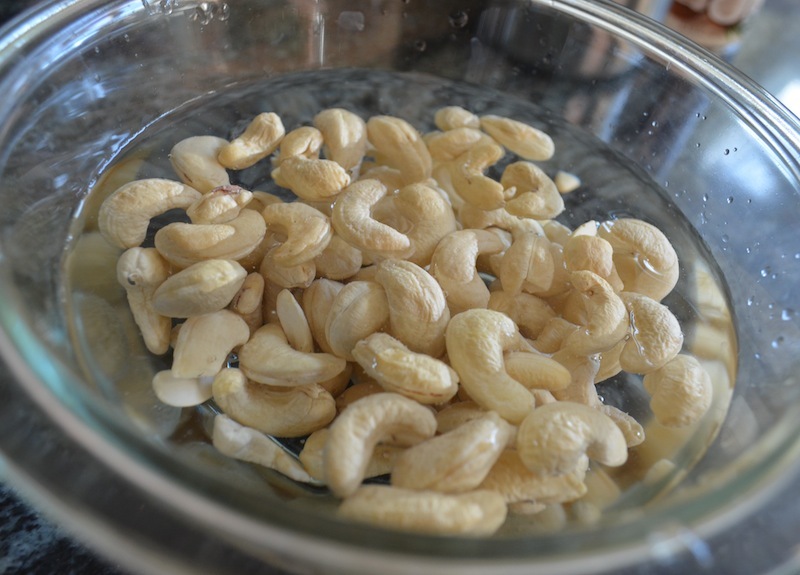 Let soak for 2-3 hours to soften the cashews and make them easier for blending.Drain the cashews. Place all the ingredients in a blender. I recommend putting the maple syrup and non-dairy milk in before the cashews or strawberries and/or raspberries to make blending easier. For both the milk and maple syrup, start with 4 Tbsp and add another only if needed. Blend until smooth, pausing to scrape down the sides of the blender as necessary.Using a spatula, spoon the pudding out of the blender and into the Mason jars. If serving immediately, add desired toppings. Or cover the puddings with a lid and refrigerate until ready to serve. This recipe makes about enough to fill four 1/2 pint Mason jars.